With today’s hectic pace, it is reassuring to know that your home can be your refuge. We appreciate all that you do for your family and your profession and we carry that appreciation to work with us every day. 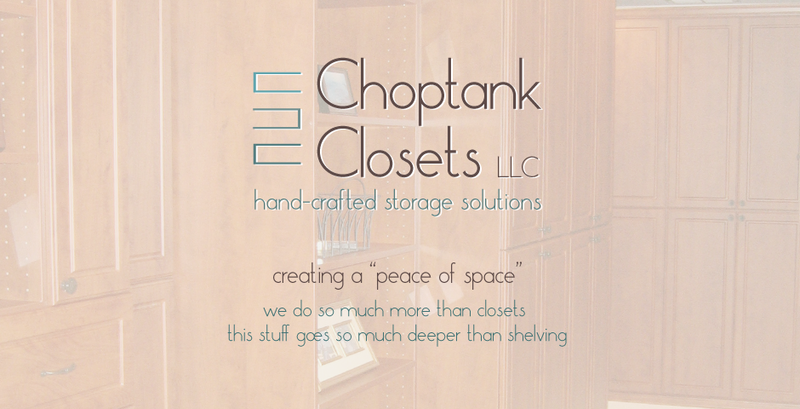 Choptank Closets commits to design and deliver “a peace of space” for your home, office or other environment. Using state of the art 2 and 3D computer renderings and on site consultations, Choptank Closets will collaborate with you to maximize all existing storage space and define new spaces where none existed previously. We will work with your specific needs and ideas as well as demonstrate our own consistent excellence in all-room design to organize and maximize storage function to suit your budget. Our courteous and professional design and installation staff takes pride in creating “a peace of space” for you. The result is a beautiful new closet, home office or extra sleeping system that is beyond imagination. Choptank Closets has over 75 years of combined classic and innovative woodworking skills. With our 3000 square foot cabinet building facility including a professional paint room and a dedicated showroom, we’re well equipped to offer our clients a range of custom wood and wood-stain options that will seamlessly transition between what was and what now can be. We will create the unique look that you desire…whether you want our exceptional Melamine wood-tone products or completely custom, solid wood cabinetry. Creating unique, one-of-a-kind storage, sleeping, office and closet designs is our passion and our commitment. We look forward to creating with you. Choptank Closets is proud to present a gallery of projects. Read all about how much we love a challenge! As you’ll see, we love a challenge. In addition to working with a more typical reach-in or walk in closet with four “regular” walls, we love working with unique, small & large spaces. We’re undaunted by architectural details like clipped ceilings, alcoves, dormers, original existing cabinetry, fireplaces and more. Your challenging space just furthers our commitment to finding exactly the right solution for you. You know you’ve put off that project for far too long! We’d love to help you turn that frustrating space into your new favorite space. To get started, fill out the quick form below and we’ll be in touch as soon as possible. Filling out this form does not obligate you to anything at all. It’s just a super easy way to get the conversation started. So, let’s go! What time of day would you prefer we contact you? We’re located in Easton, MD near the beautiful Choptank River. © 2014 Choptank Closets LLC. All Rights Reserved.